By Glen Anglin: Juan Manuel Marquez has an advantage in his showdown with the great Manny Pacquiao that none of his recent opponents had: his size. Yes, his size. Since he is essentially the same size as MP, he will not be inclined to do what the string of larger Pacquiao opponents have tried to do. That is, they have tried to use their larger size to bully Pacquiao; to walk him down and impose their larger size and greater strength on him. Unfortunately for them, it never works because Manny’s flashing combinations land so often that they become gun shy and unwilling to really mix it up with the Filipino Phenom. They may continue to walk forward, but they punch less and less, because they grow weary of being blazed again and again by Pacquiao’s fists. At that point they lose their spirit and go into survival mode. This happened with De La Hoya, Cotto , Margarito and Mosley, all guys who were larger framed than Pacquiao. Hatton did not have time to get timid as he was blasted out early, but I guarantee you he would have eventually tired of standing by helplessly while MP pulverized his face. 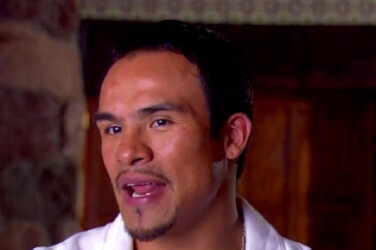 Marquez, the thinking man’s fighter, will certainly NOT wade into Pacquiao like those bigger guys. He will stand in close and try to draw Manny into leading the exchanges (an easy task, given Pacquiao’s natural aggression) so that he can land his counter-punches, which are some of the best in the business. In their two previous fights, Juan landed a lot of those counter shots, but not quite enough to win a clear decision. In the past I thought that Manny’s defense was not top shelf; he seemed to get hit too often. But the more I think about it, the less I am convinced that’s true. It’s true that his defense does not match his offense; Manny is the best offensive boxer alive. But think about it, how can any fighter who is so aggressive and throws as many power punches as Manny be invulnerable to return fire. It is inevitable for him to get hit more than just a little. So, given his fighting style, it’s an accomplishment in itself that he gets hit as little as he does. That said, I think that as long as JMM sticks to his game plan and takes the fight to the late rounds, he has a good chance of upsetting the great Pacquiao. His counter-punching style and technique might be the Kryptonite that will negate Pacquiao’s eye-popping punching ability and end the Filipino’s impressive winning streak.